Put your hands in the air—Intel has made another major push into the world of touch-free computing. The chip maker confirmed on Tuesday that it bought Israel-based Omek Interactive, a gesture-recognition firm. Omek (which means ‘depth’ in Hebrew) offers gesture-recognition products for computer and software makers that can track full-body movements as well as finer detail hand and finger gestures. Under Intel, Omek will help the chip maker in its ongoing push to popularize perceptual computing, Intel’s vision for the future where we interact with our PCs and other devices using hand gestures, voice commands, and facial tracking. “The acquisition of Omek Interactive will help increase Intel’s capabilities in the delivery of more immersive perceptual computing experiences,” Intel spokesperson Guy Grimland said. Intel representatives show off the company’s perceptual computing efforts at the Game Developers Conference in San Francisco this past March. Intel hopes to see perceptual computing go mainstream in the near future. In March, Intel was at the Game Developers Conference in San Francisco talking up its perceptual computing platform. In June, the company’s investment arm, Intel Capital, announced a $100 million fund to invest in software and application projects involving perceptual computing. In late 2012, the company released a software development kit (SDK) to help developers take advantage of Intel’s new interactive capabilities. Intel also recently closed the submission process for its Perceptual Computing Challenge, a contest with a $100,000 grand prize for the best use of the company’s new technology. But don’t count on seeing a flood of perceptual computing applications just yet. “It’s going to take several years for this technology to spread as processing power improves, and gesture libraries further mature and develop,” says IDC’s Michael J. Palma, research manager for consumer semiconductor and electronics manufacturing (IDC and PCWorld are both owned by International Data Group). Palma doesn’t expect to see perceptual computing go mainstream for at least another two to four years. Perceptual computing may not be mainstream yet, but chances are anyone with a newer PC already has the equipment to take advantage of some of Intel’s gesture-filled platform. For example, PCs with at least a second-generation Sandy Bridge Core processor should be able to take advantage of applications built with Intel’s perceptual computing SDK. 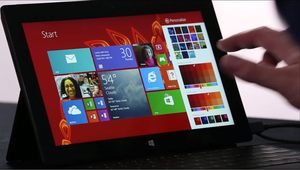 Users have yet to embrace the touch-driven elements of Windows 8. But will you want to use it? Users have yet to embrace new ways of interacting with their computers beyond the traditional mouse and keyboard. PCs powered by Microsoft’s Windows 8 OS, for example, have not really succeeded in bringing touch to the desktop. In fact, with a new boot-to-desktop feature coming to Windows 8.1 following user outcry, it’s arguable that touch on the PC has failed to even augment the traditional mouse and keyboard set-up. Gesture recognition and facial tracking looks really cool in the movies, but can it succeed on the desktop? “Touchscreens on PCs are a little awkward,” says IDC’s Palma, who argues that a gesture-filled future would be more compelling. Instead of having to reach out and put your hands all over your PC display, a quick flick of your finger or hand gesture in mid-air offers an easier and more immersive experience. Leap Motion is bundling its 3D motion camera with select HP PCs. Intel isn’t the only company working on perceptual computing experiences for the PC. San Francisco-based start-up Leap Motion is touting a 3D motion camera for Mac and Windows. The company plans to start shipping its device to consumers next Monday, after signing a deal in April to bundle its camera with select HP PCs. Samsung’s recently released Galaxy S4 smartphone offers a number of eye-tracking and air gestures for scrolling Webpages, flipping through photo galleries, and answering phone calls. Google added facial recognition to Android as a lock screen security feature in 2011. Microsoft is also touting the future of movement recognition with Kinect. What started out as an add-on for Xbox 360 gamers has become its own platform for the PC—thanks in no small part to technology enthusiasts. Perceptual computing has been a longstanding interest for Microsoft. As early as 2010, the company was rumored to be looking at facial recognition and eye-tracking technologies to play a big role in Windows 8. The rumored features didn’t end up making the cut. Now with Intel pushing its perceptual computing game, the two companies may end up as competitors in the emerging world of gesture and facial recognition interaction for PCs. Smile and wave, folks: In a few years every PC you own may be watching you. Agam Shah of IDG News Service contributed to this report.